We’ve completely restructured our youth programs to create tennis programs especially for ages 10 and under. We now offer seven different levels of 10 and Under clinics, each tailored by ability level. We use different balls, different nets and different-sized courts depending on the class. We also offer kids the opportunity to participate in match play and tournaments. While children are having fun and playing with friends they’re learning a new sport in a way that feels comfortable and familiar. Our kids gain confidence and build better skills in a sport they can play for a lifetime! Game On: (Ages 3 To 4) – CHHRC’s Game On program is designed to introduce the children to the sport of a lifetime, while working on hand eye coordination, agility and balance. They will learn the basic strokes in tennis all in a fun and safe environment. Each session will consist of a different theme and are 45 minutes long. Red Court: (Ages 5 To 8) – No previous tennis experience is required. This program uses the 10 and under tennis model: smaller racquets, lower compression balls, and smaller scaled courts. Children will learn the fundamentals of the game while learning in a safe and fun environment. Hand eye coordination, agility and balance will be emphasized throughout this program. Red Court Advantage: (Ages 6 To 8) – CHHRC’s Red Court Advantage program is the next level up from Red Court. These players will continue to work on building coordination, agility and balance in a fun and safe environment. In order to participate in this program you must be able to hold a consistent rally of 5 shots and start a point with a serve. During this program children will compete against others in different match formats, work on their contact point, learn spin, placement and proper grips. Orange Court: (Ages 9 To 10) – No previous tennis experience is required. 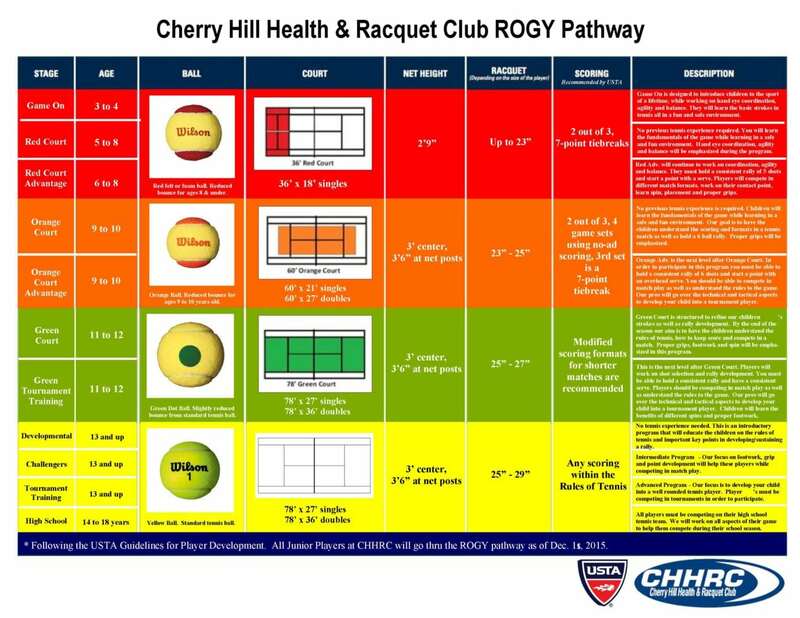 This program uses the 10 and under tennis model: smaller racquets, lower compression balls, and smaller scaled courts (60ft). Children will learn the fundamentals of the game while learning in a safe and fun environment. Our goal is to have the children understand the scoring and formats in a tennis match as well as hold a 6 ball rally. Proper grips will be emphasized. Orange Court Advantage: (Ages 9 To 10) – CHHRC’s Orange Court Advantage program is the next level up from Orange Court. These players will continue to work on building coordination, agility and balance in a fun and safe environment. In order to participate in this program you must be able to hold a consistent rally of 6 shots and start a point with an over arm serve. You should be able to compete in match play as well as understand the rules to the game. Our pros will go over the technical and tactical aspects to developing your child into a tournament player. Private Youth Tennis Lessons – Private youth tennis lessons are available for all players, both members and nonmembers. Private tennis lessons are personally arranged with the tennis pro of your choice.To schedule a tennis lesson, please contact Rick Hoffmann at 856-429-1388, x166, or rhoffman@chhrc.com.